I love to buy cookbooks, and there are a lot of them by now, haha, but it still makes me happy each time that I get my new book. Lately, there are a lot of books which come with some pan, equipment etc., for me they are some kinds of toy, not only a book ^^. If you want to start baking something easy you can buy a book with a kit too, I think it's great idea. This time I bought レンジで簡単! オリジナル型付き デコ★クレープ作っちゃお! By Junko. 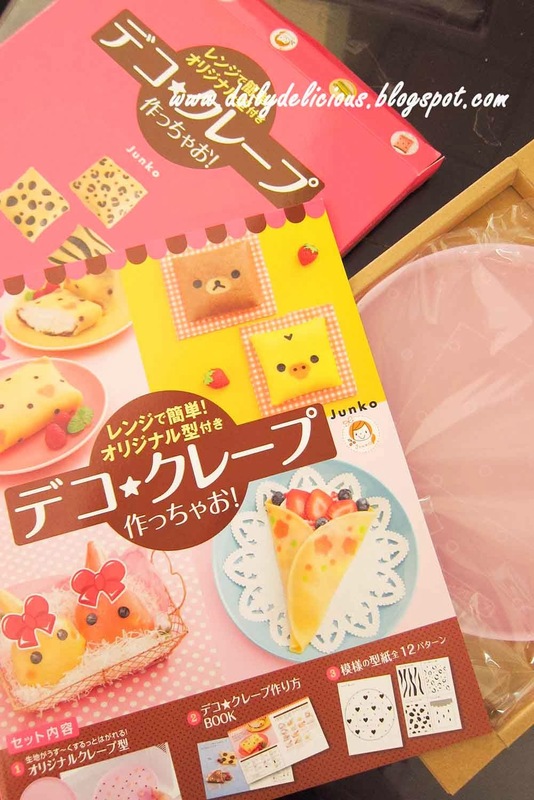 A recipe book with plastic microwavable crepe tray for making small crepe in the microwave. It's so cute, hehe. 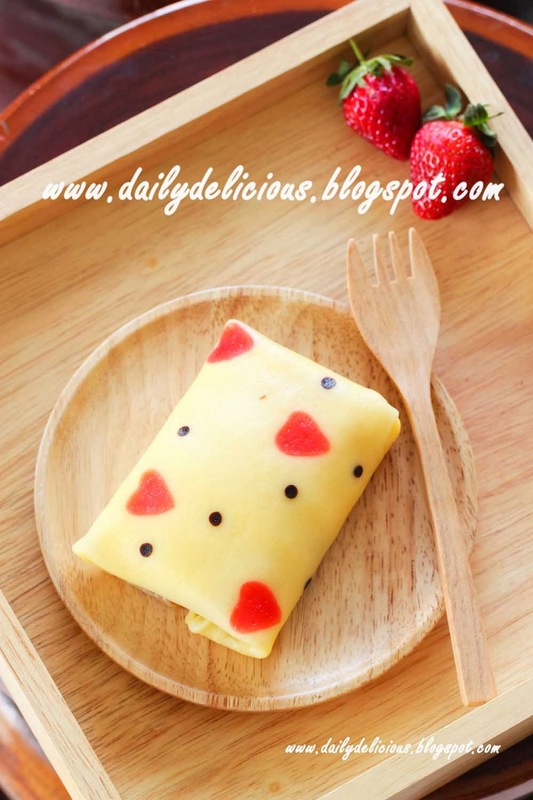 I followed the method in the book using the tray to make lovely small crepe. 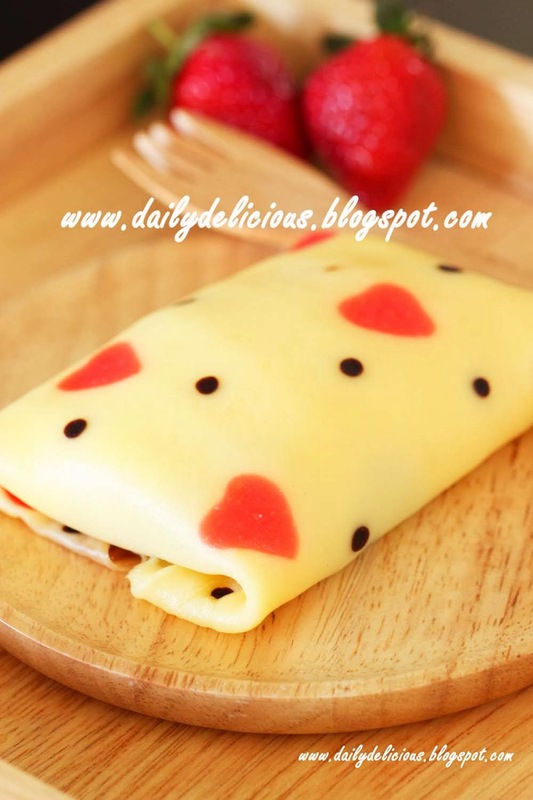 It's easy to use but the hardest thing is to get the thickness of the crepe right. When pouring crepe batter into the tray, you have to make sure it cover the pattern and not too thin, but too thick too, or it will take longer to cook. You can use the same batter to make crepe in the pan, but with metal pan you can't get the same pattern. Ps. I have to say that if you heat the crepe too long in the microwave it will taste like rubber, so be careful with it. Sift the flour and sugar into a bowl, pour beaten egg and 1/3 of the milk into the bowl, stir to combine. Pour the rest of the milk into the bowl, stir until fully combine. Pour the melted butter into the bowl, stir to combine, then strain through sieve. Cover and refrigerate for 3 hours before using. 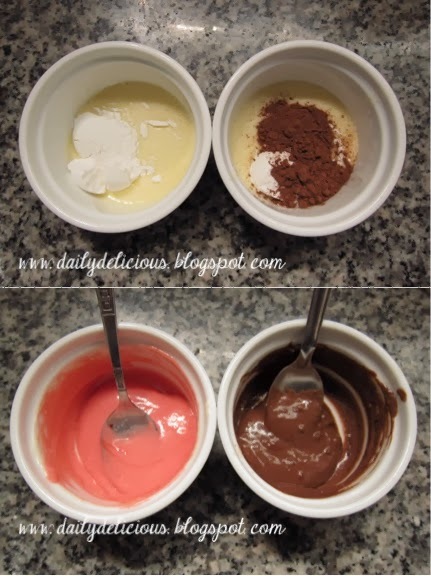 Remove the batter from the fridge, put 1tbsp of batter into each small cup, then put 2tsp of flour into one cup with a drop of red food coloring and 1tsp of flour and 1tsp of cocoa powder in other cup. 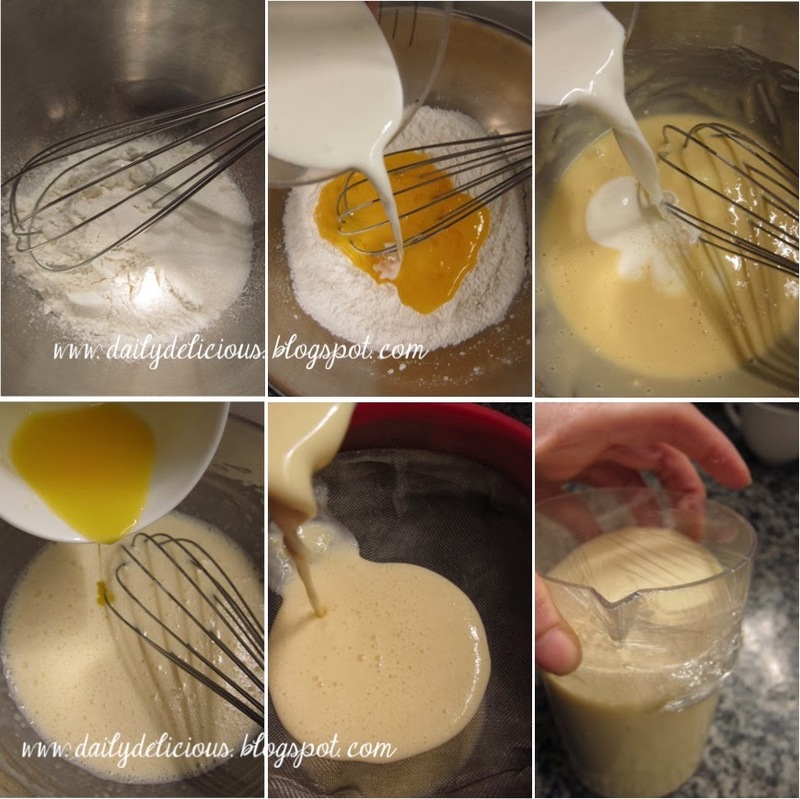 Stir the mixture in each cup until smooth if it too dry add more batter 1tsp at a time. 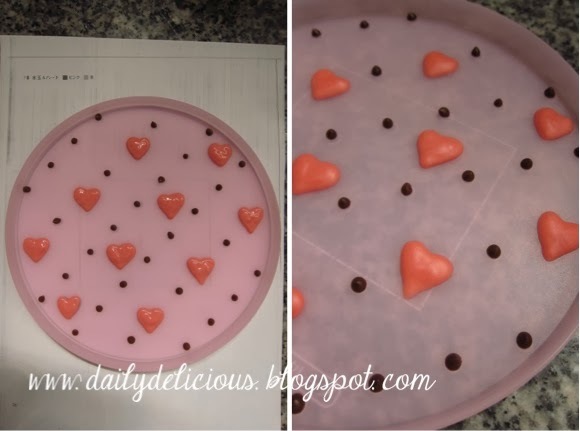 Put the colored batter into small piping bag, and pipe the pattern on the plastic crepe tray. Heat in the microwave for 20 seconds (600w), if the pattern is not dry, heat for 10 seconds more. Pour the batter over the tray and heat again for 2-2.50 minutes (600w) (if the crepe not cook throughly heat again for 10-20 seconds). Let the crepe cool on a wire rack. Whip whipping cream with sugar and fill crepe with whipped cream and banana with chocolate sauce. Wow your crepe looks so beautiful. 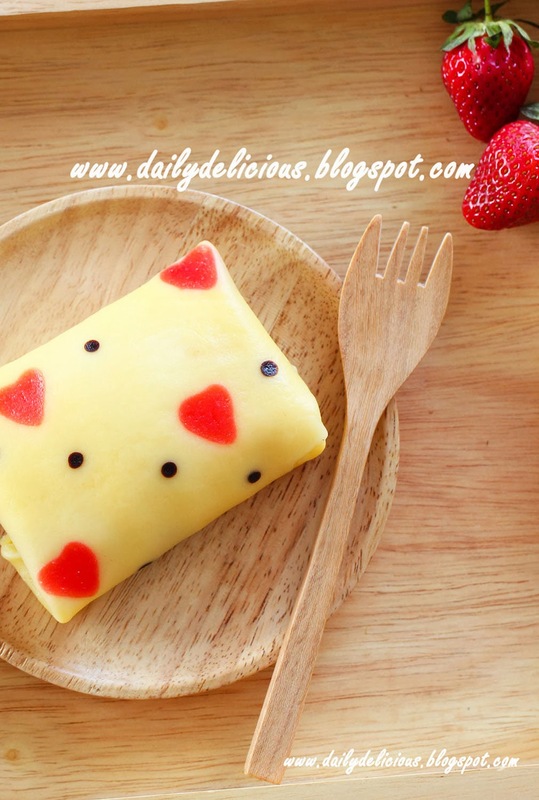 Never knew could cook crepe in the microwave. Thanks for sharing. 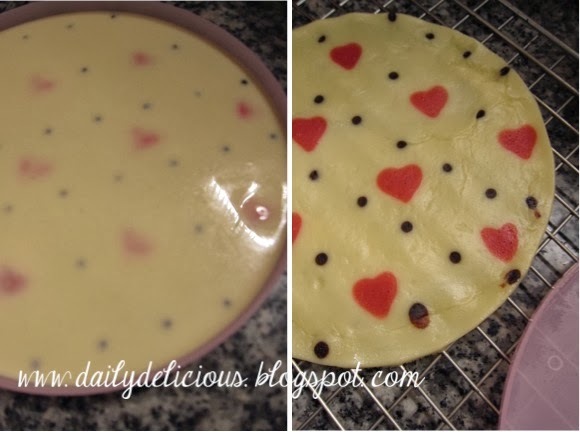 Great post thanks for sharing one of the wonderful recipe. 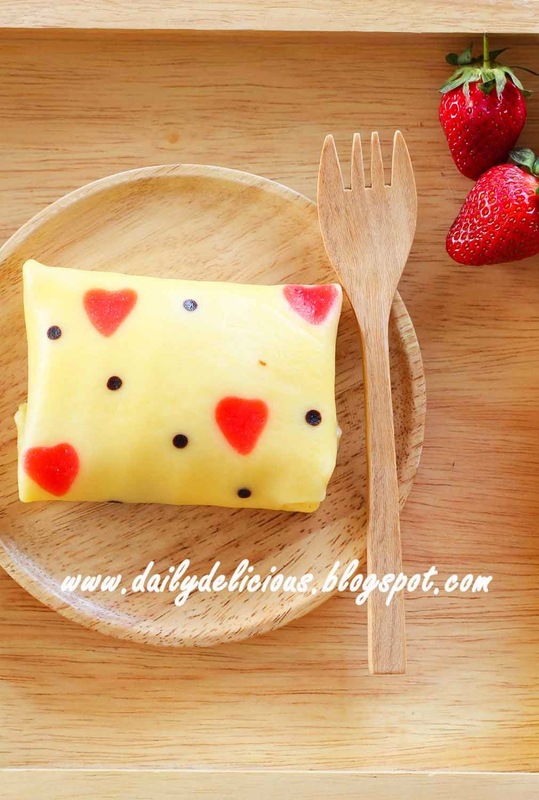 I also like to experiment such recipe using microwave. No, with this one you need a microwave ^^. The book is in Japanese only ^^.